Complete & complimentary foods for mice and rats. An all-in-one meal created especially for your pet rats’ needs as omnivores. Each nugget contains the perfect combination of vitamins, minerals and nutrients. 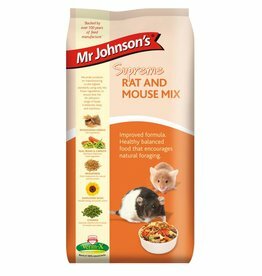 Mr Johnsons Supreme Rat & Mouse Food Mix 900g is a fibrous, nutritious and wholesome blend of cereals, grains, vegetables, seeds, mealworms and extrusions. Supreme Tiny Friends Farm Reggie Rat & Mimi Mouse Tasty Mix Food 2.5kg is nutritionally balanced and suitable for rats and mice of all shapes and sizes. 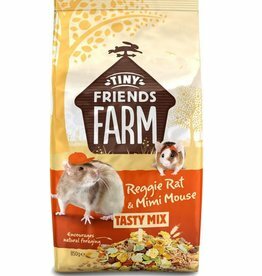 Supreme Tiny Friends Farm Reggie Rat & Mimi Mouse Tasty Mix Food 850g. 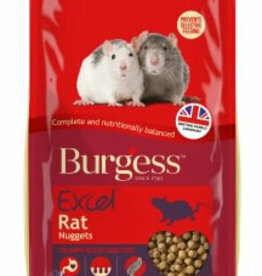 A nutritionally balanced food suitable for rats and mice of all shapes and sizes.